In our current moment of political and moral crisis, the Guru’s birthday offers an opportunity for reflection. His life shows us the path of spiritual activism — how to fight for justice through the ethic of love, even in an era of rage. In paintings, the Guru is often depicted with a bow and arrow, sword in hand, falcon on his shoulder, the fierce warrior. But sometimes we find him holding a musical instrument, the devoted saint. He is both. He shows us the courage to face the fires in the world and our own lives with a warrior’s heart and saint’s eyes. The fires burn bright right now. It’s a time of enormous rage and explosive nationalism in America and around the world. You may feel depressed, confused, or hopeless. You may even want to give up. 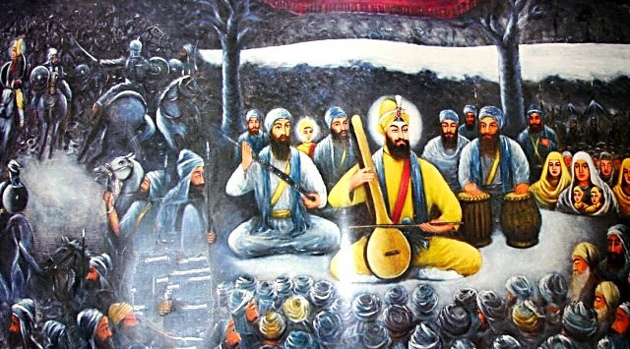 In Guru Gobind Singh’s time, forty soldiers abandoned him during a great battle. When they returned to their village, a woman Mai Bhago told them: You will not hide from the fire. You will return to the fight – and I will lead you. Donning a turban, mounting a horse with a sword in her hand and fire in her eyes, she took them where no one else would. She became the one she was waiting for. Finally, remember that warriors do not go to battle alone. Guru Gobind Singh Ji — and so many prophetic leaders — show us that when we stand up to tyranny together, we can win. So let’s do this together. Find your modern-day sword and Dilruba, then act.